GLUTEN FREE VEGAN CHEESE BLINTZES with DAIRY FREE instructions. After creating my recipe for GF Cheese Blintzes I made a dairy free version for some friends. I had been meaning to post the dairy free filling ingredients, but had been waiting to be able to add a vegan crepe recipe as well. Well, I finally did it. A vegan crepe with a vegan filling that tastes as good as a ‘real’ cheese blintz. OK, it is not the same and would not be mistaken for a dairy full one, but it tastes really really good. I converted a vegan crepe recipe into a gluten free one. 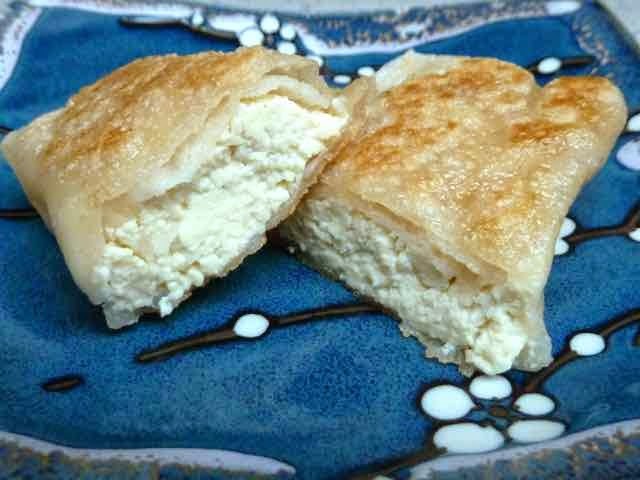 The filling recipe I created from scratch using tofu and dairy free cream cheese. The vegan crepes are a bit more difficult to make than the ones with egg. It is important to cook the first side really well before attempting to turn it over. 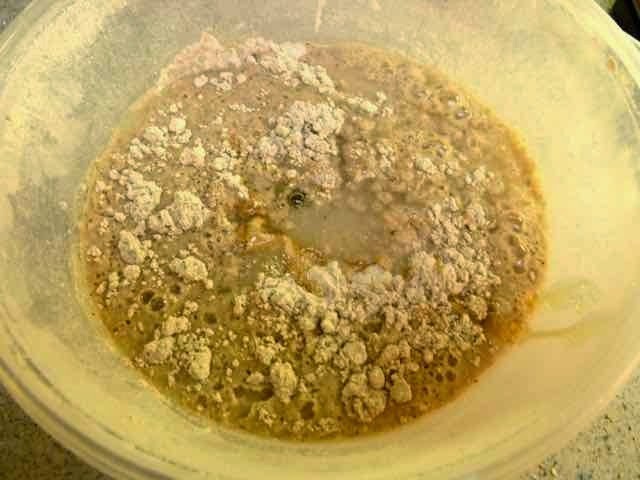 The batter is very gummy if it is undercooked. I tried to turn the first one too soon and it clumped together into a gooey glob. It took 1½ - 2 minutes for each side. I ended up turning the heat down so the crepes would not brown so much while cooking. The texture of the cooked vegan crepe is just right for blintzes. No gums were needed for the crepe or the filling. They held together fine without binders or egg replacers. 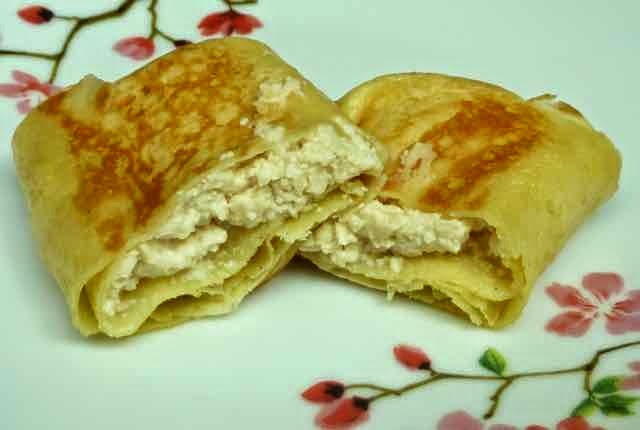 These blintzes can be frozen and heated up later to use as desired. In a large bowl add the flours, sugar & salt and mix well. 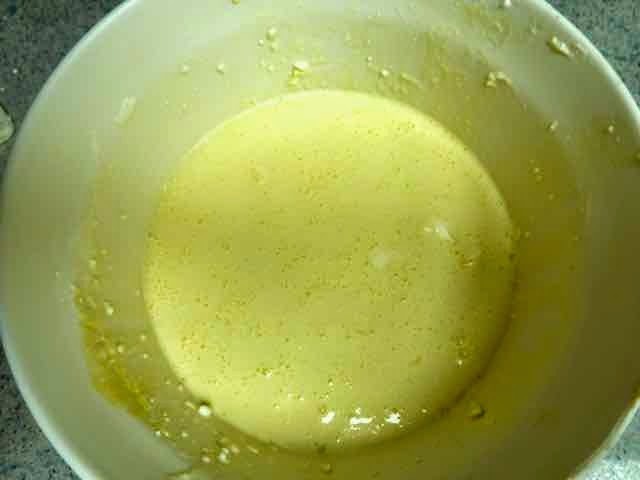 Add the water and non dairy milk and whisk together until the batter is smooth and lump free. 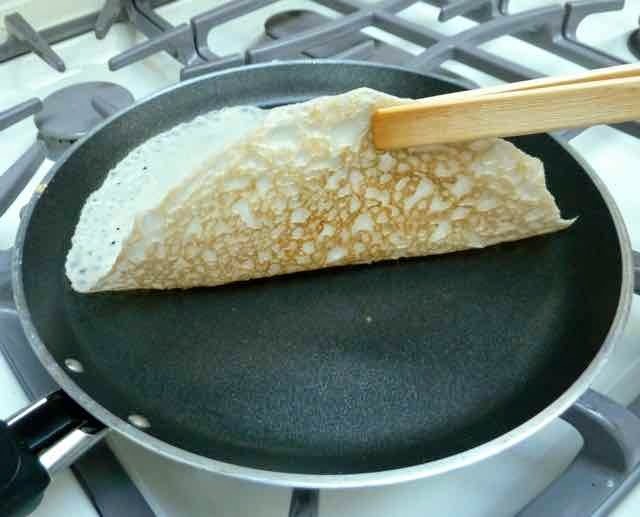 When ready to cook the crepes, heat a crepe pan using a low/medium heat. 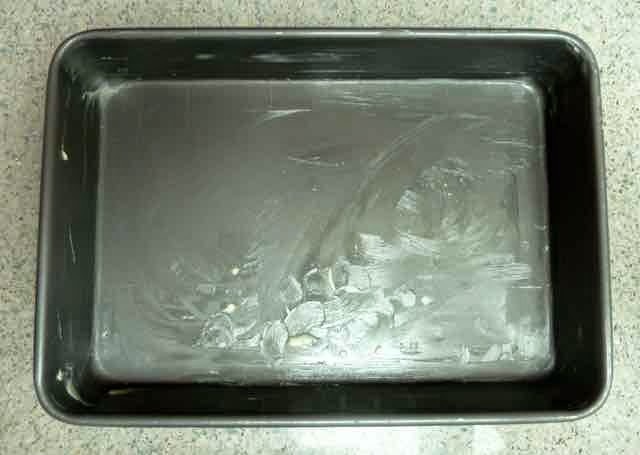 Use vegan margarine to grease the pan. 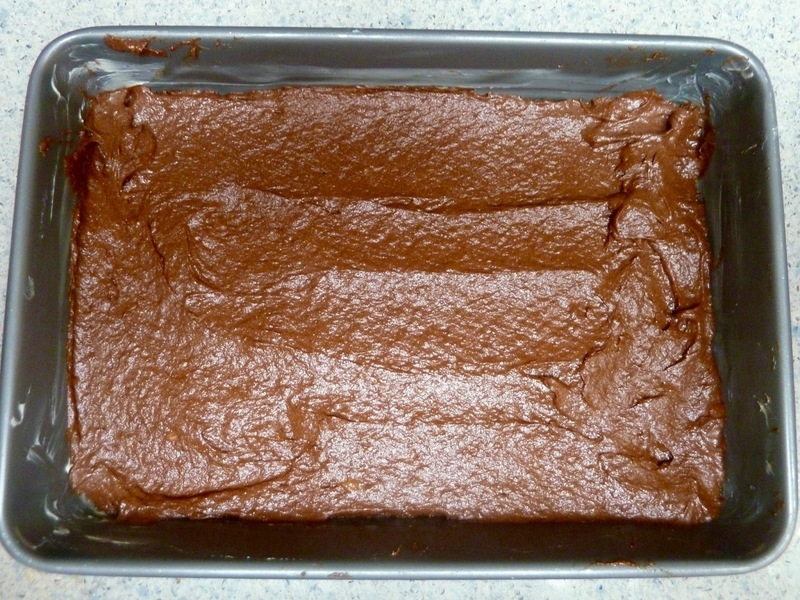 Pour 1/4 cup of the batter onto the pan while tilting and turning the pan to spread the batter all over the bottom. 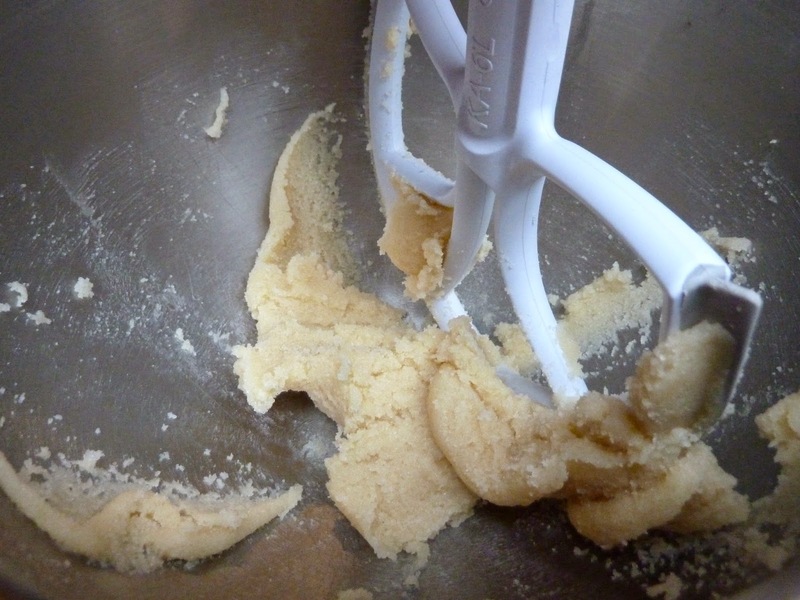 If there are holes use a spoon to drop and spread some batter to patch the holes. Cook the crepe 1 1/2 - 2 minutes until the top is dry and the bottom is a bit firm. Flip the crepe over and cook on the other side another 1 1/2 - 2 minutes. Flipping the crepe with wooden tongs. Cooking the second side of the crepe. so that they would not brown so much. Place the cooked crepe on a plate. 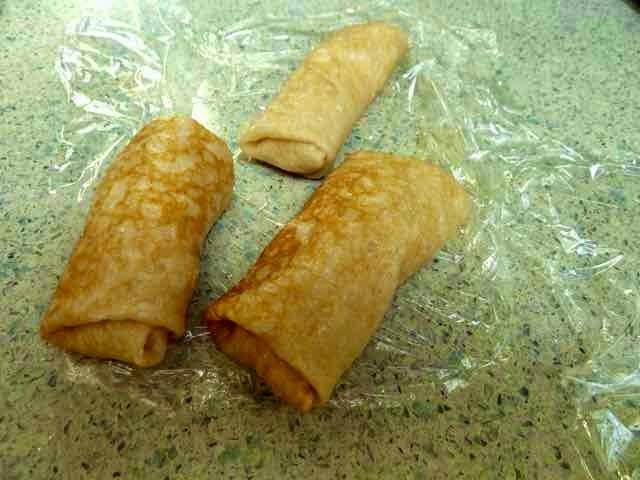 Pile the cooked crepes between pieces of plastic wrap. Dairy Free egg crepes with tofu filling. If you can eat eggs I recommend that you use the crepe recipe on my blog that I used for regular blintzes. They are easier to cook. 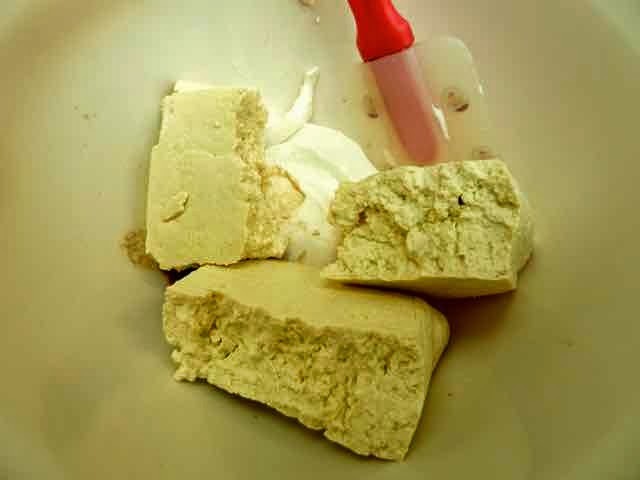 1) Press the excess water out of the tofu by putting the block of tofu between two flat plates. 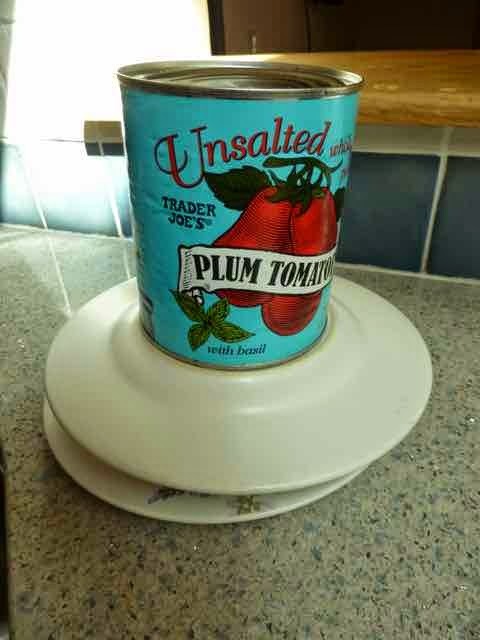 Then put something heavy on the top plate to help to press out the water. I use canned foods. Every 10 minutes or so pour off the excess water. 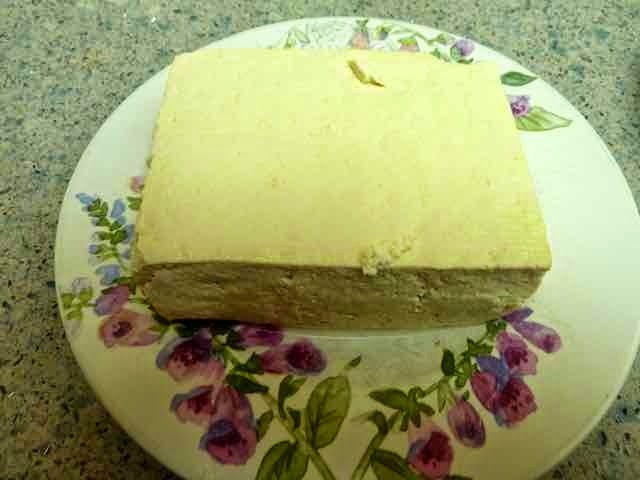 Undrained tofu on a flat plate. 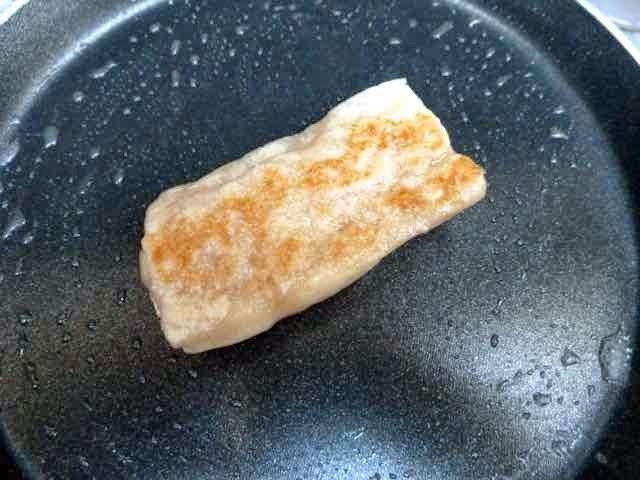 Undrained tofu on flat plat with second plate on top. 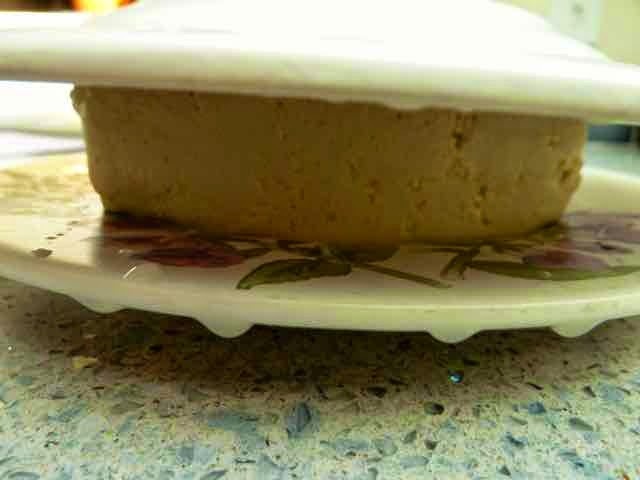 of the plate to help press the water out of the tofu. 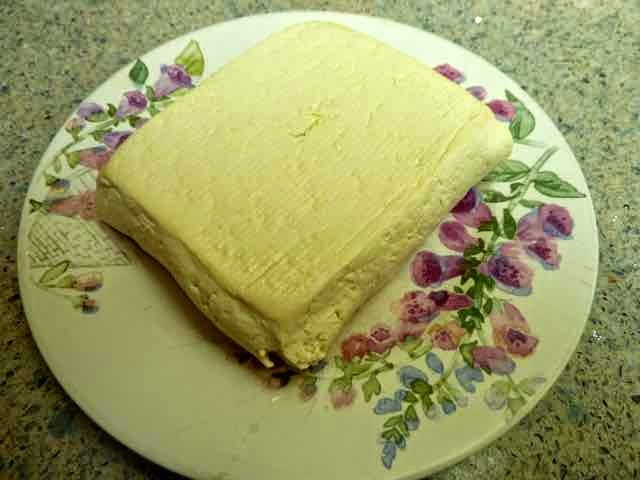 Tofu after pressing and draining the excess water out. 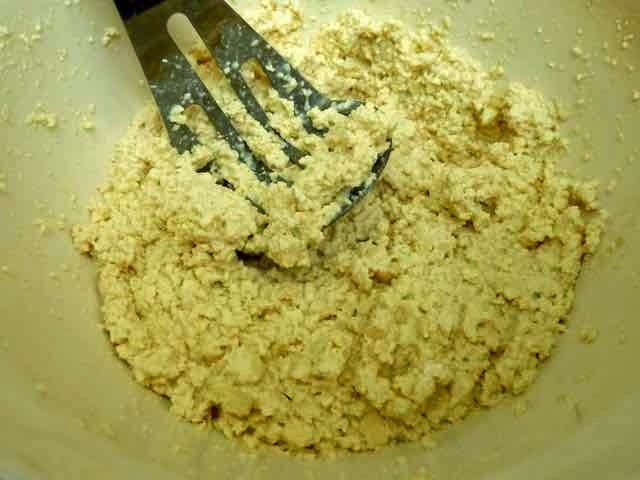 2) Add the pressed and drained tofu to a large bowl and mash with a fork or potato masher until there are no lumps. The rest of the ingredients in a bowl. Drained and pressed tofu added to the bowl with the other ingredients. All the ingredients mashed together until lump free. I used a potato masher, it works fast and easily. 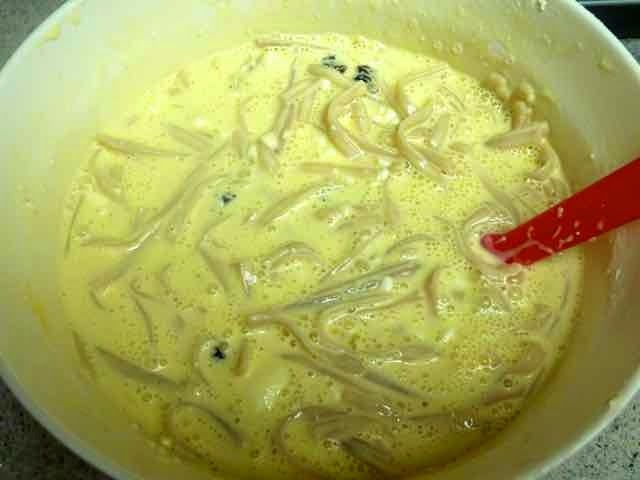 3) Add the rest of the ingredients and stir together with a spoon until well combined. 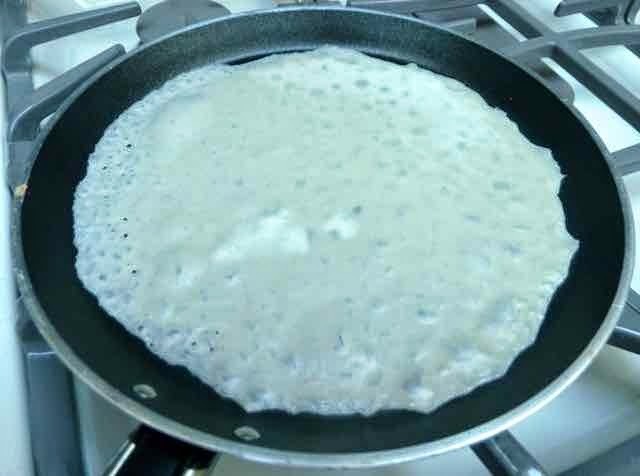 Place 2 tablespoons of filling on the bottom third of one crepe. I prefer to have the crepe’s side that was cooked last facing up. Crepe with 2 Tbs. of filling on the bottom third. 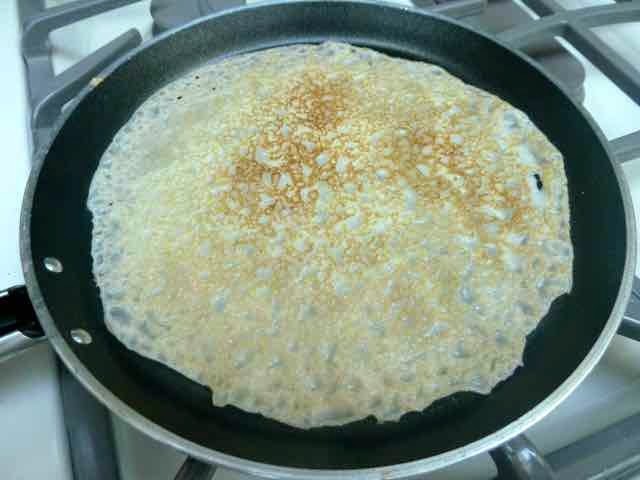 Fold up the crepe to encapsulate the filling. 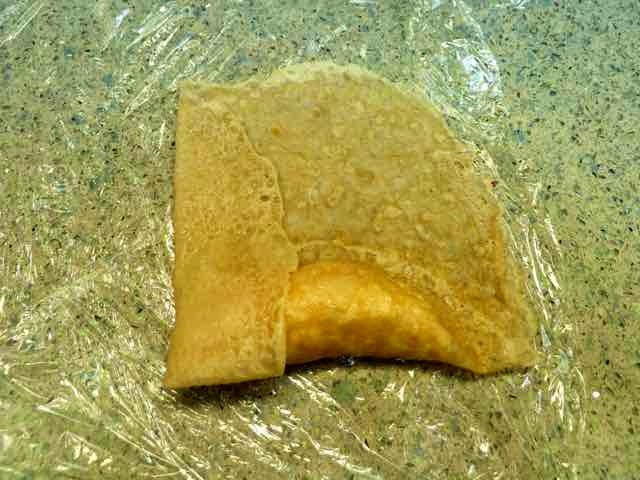 The bottom of the crepe folded up to encapsulate the filling. Fold one side of the crepe, then the other. 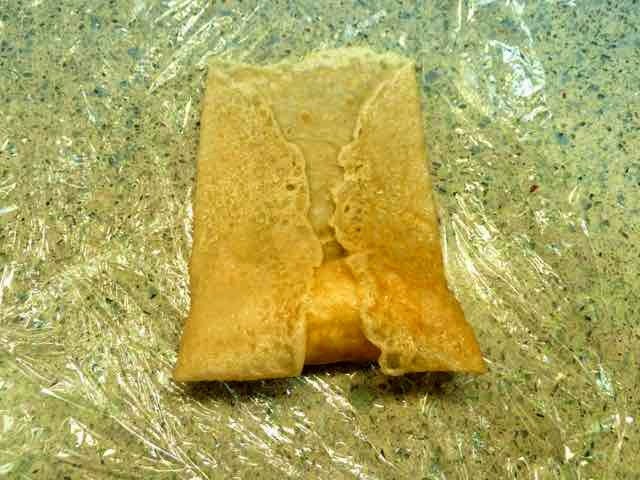 Folding one side of the crepe. The second side of the crepe folded. 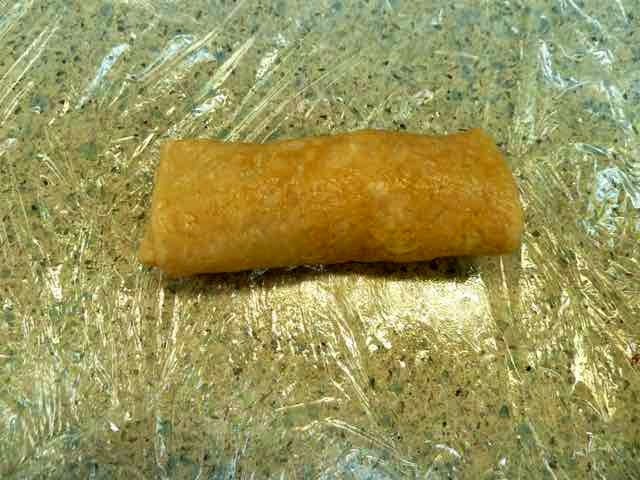 Roll up the cheese encapsulated part until you have a small egg roll or burrito shaped tube. 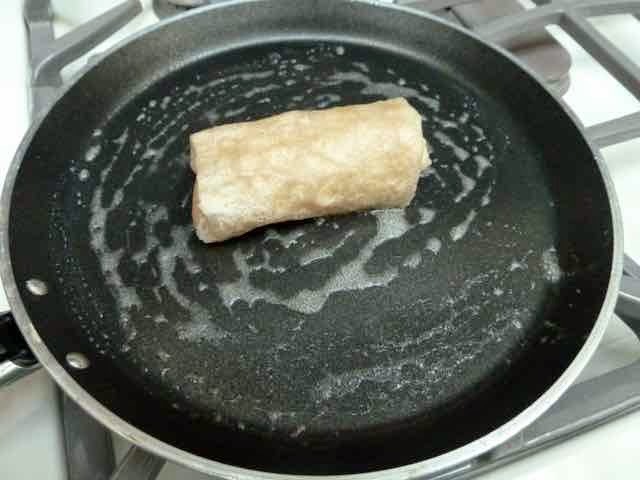 Rolling up the crepe in to a 'burrito'. The crepe rolled up into a blintz. 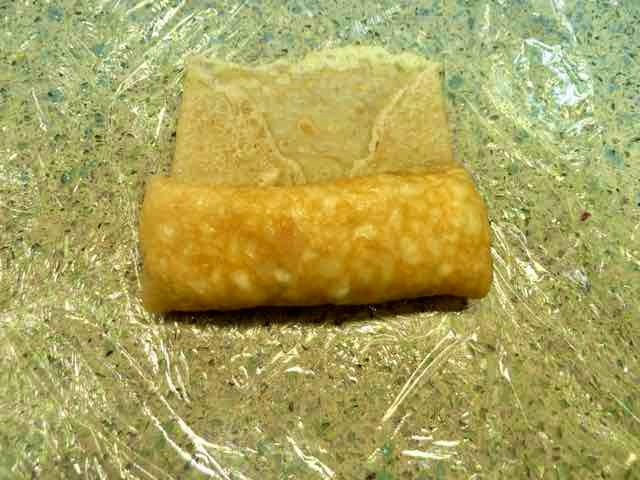 The bottom of the blintz. This side gets cooked first when heating the blintzes. Heat a pan over low - medium heat and melt some vegan margarine in it. Heat the crepes, a few at a time, seam side down, in the pan. The crepe should be lightly browned on that side. Heating and browning the blintz seam side down first. Turn the crepe over and lightly brown the second side. The blintzes should be lightly browned on both sides and heated in the center when done. 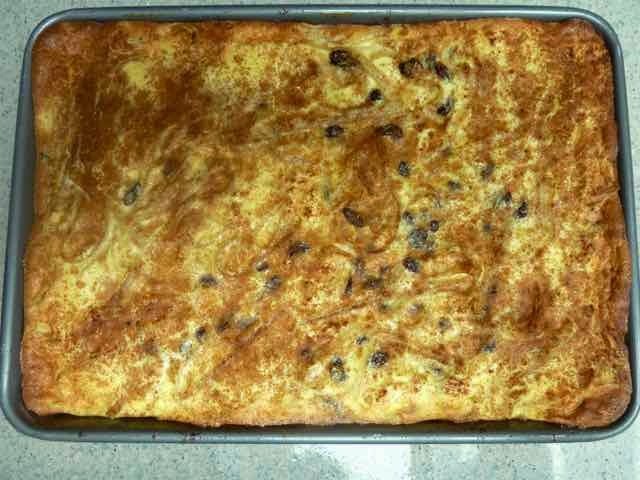 A browned and heated blintz. 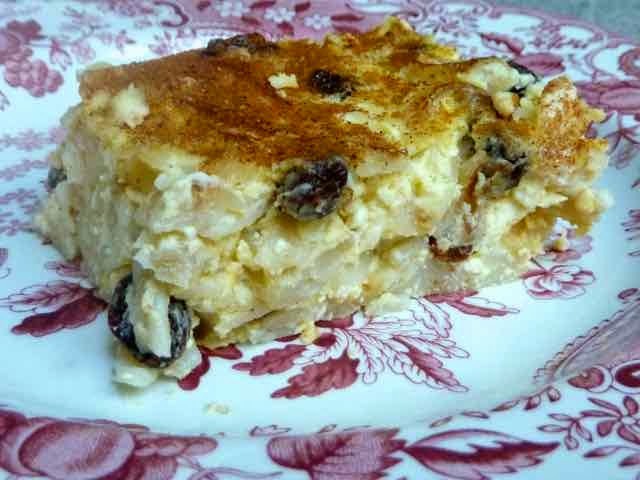 Serve with dairy free sour cream, or yogurt and fruit preserves. Some people like them with maple syrup and ‘sour cream’. Some people like to use fresh fruit and other like them plain. Have them any way you like. You should cook and eat the assembled blintzes within 3 days (keeping them in the fridge). 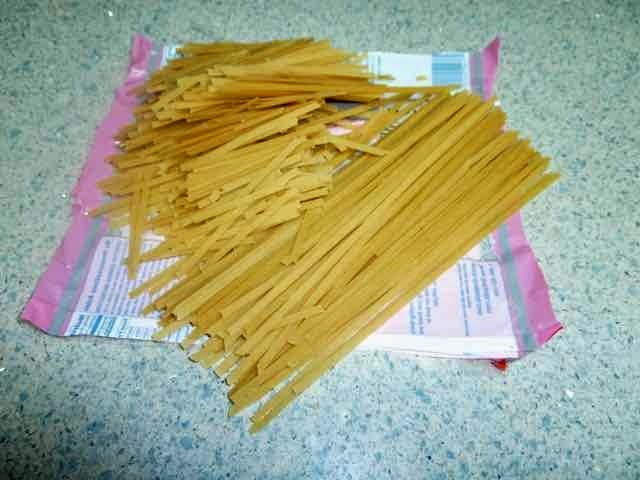 Freeze them, wrapped well, for longer storage. 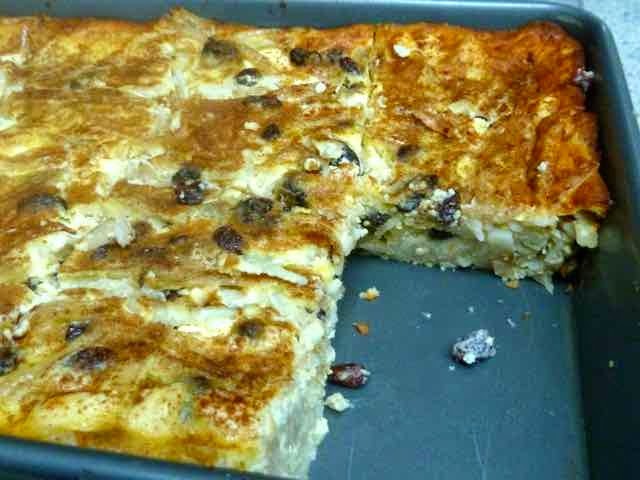 Thaw, then heat and brown them up in a pan when ready to eat the blintzes. 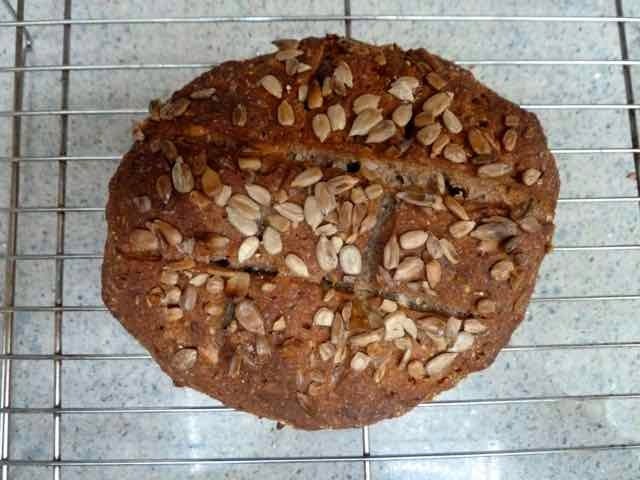 I have been trying recipes from a recently published cookbook Gluten-Free Artisan Bread in Five Minutes A Day by Jeff Hertzberg, M.D. and Zöe François. 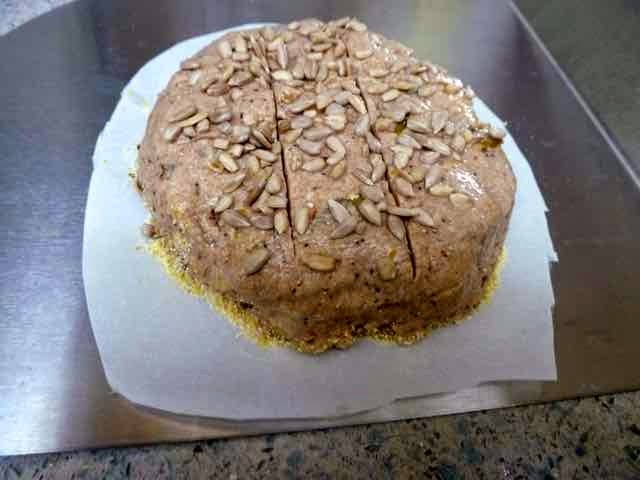 The authors have come up with a bread baking method that is easy, convenient and creates amazingly wonderful gluten free breads and bread like baked goods. 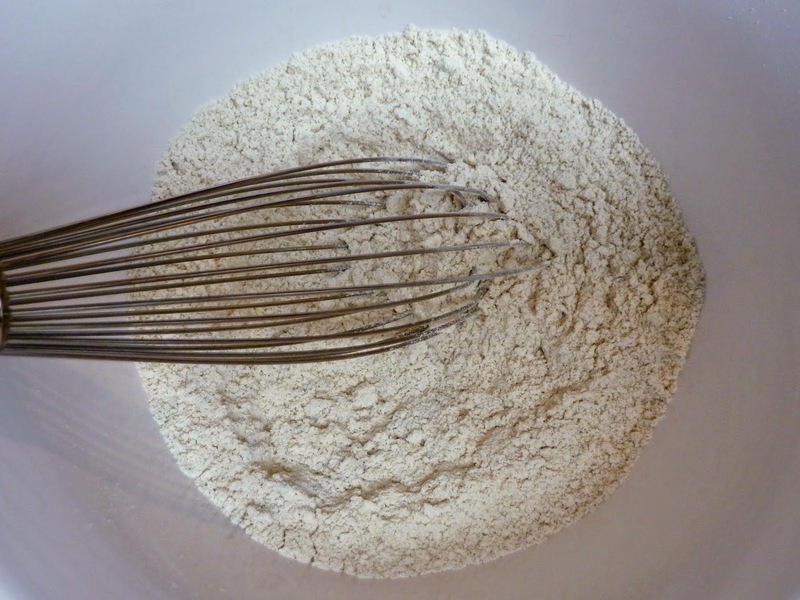 There are some basic flour blends that you mix up. Then you make a batch of dough from the basic flour blends. The batch will make about 4 loaves of bread. 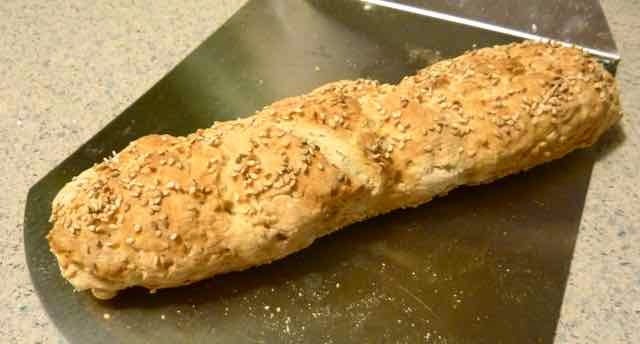 No mixer needed, the bread texture is great with just hand stirring. 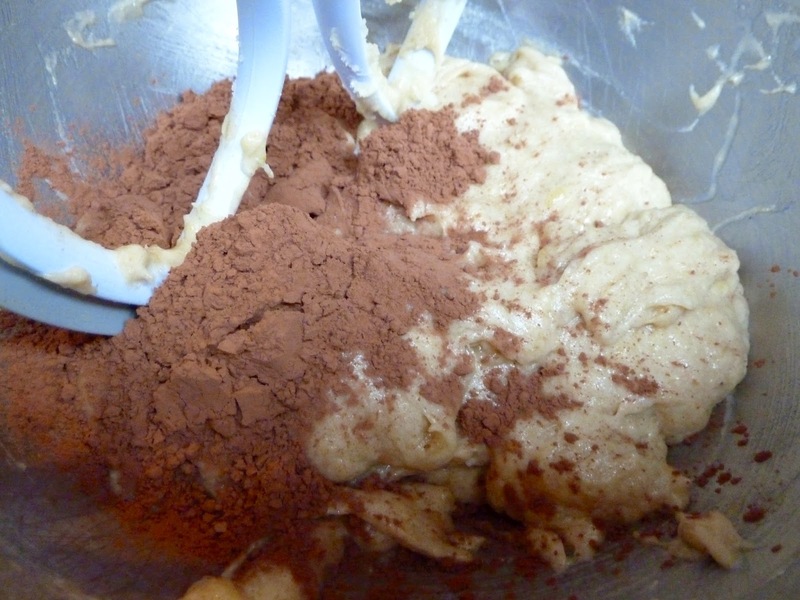 You can easily halve or double the amount of dough or flour blends that you make. 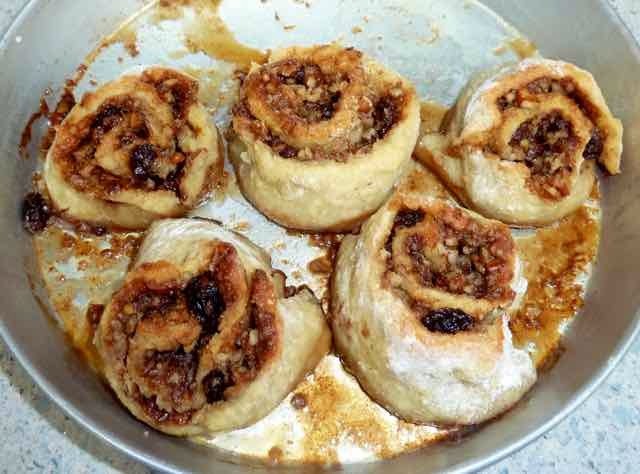 You keep the batch of dough in the fridge for up to 5 days and make baked goods from the dough as you want it. The “bread in five” minutes refers to the time it takes to form a loaf as you need it, not the mixing, baking and rising times. That said, it is great to have fresh bread at whim. 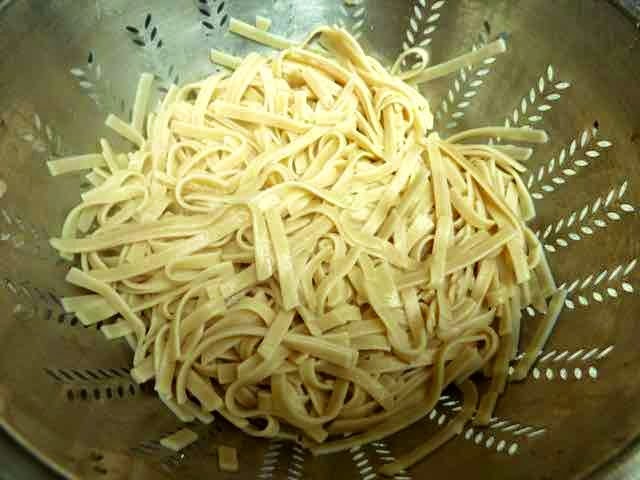 The book includes instructions for replacing ingredients, so if you don’t eat dairy or eggs or some of the flours or gums you can still make the recipes. I love the texture of the breads. So far I have made a half batch of the Master Recipe dough and baked two bâtards, which are French breads that are wider than a baguette, more like Italian bread. 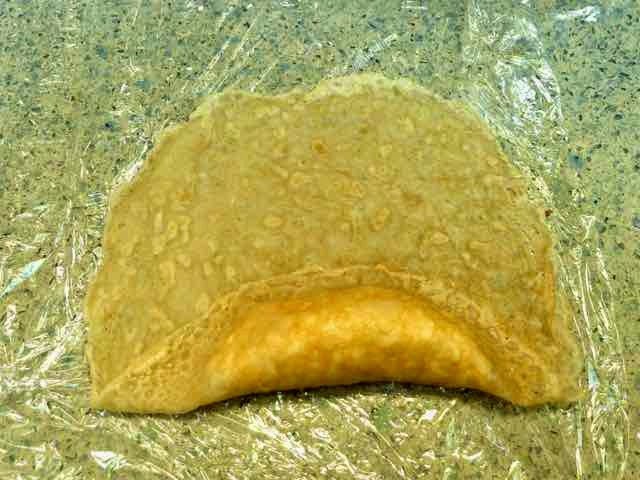 The crust is crisp and chewy and the center is soft, like I remember Italian bread was like. 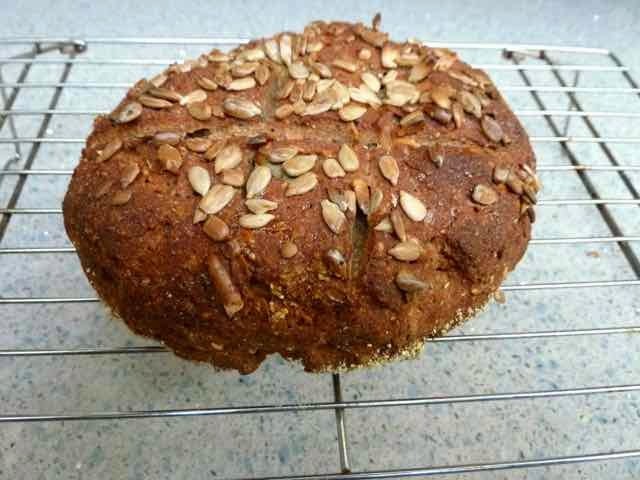 I have also made a half batch of the Seeded 100% Whole Grain loaves. I was in heaven eating this bread. The crust was amazing, chewy and crisp. The center was soft yet slightly dense. The bread was delicious, hearty and satisfying. I prefer whole grain type breads and this was perfect. I made one loaf as a boule and one I shaped into a fat short log so that I could make sandwich slices. So good. It was like a whole grain artisan bread from Whole Foods, only gluten free. I made a half batch of the Challah dough. I intended to make one loaf of Challah bread and one batch of cinnamon rolls. I made the cinnamon rolls first. OMG! Soft and delightful. The wheat eaters gobbled them up and were raving about how delicious they were. I was just so thankful to have a real cinnamon roll again. They stayed soft when cold and one day old. They did not get past that day. The only reason any lasted more than the first day was that I made one more batch of the cinnamon rolls instead of the Challah bread. I recommend that you get this book. The bread has the texture of real bread. So satisfying and enjoyable. 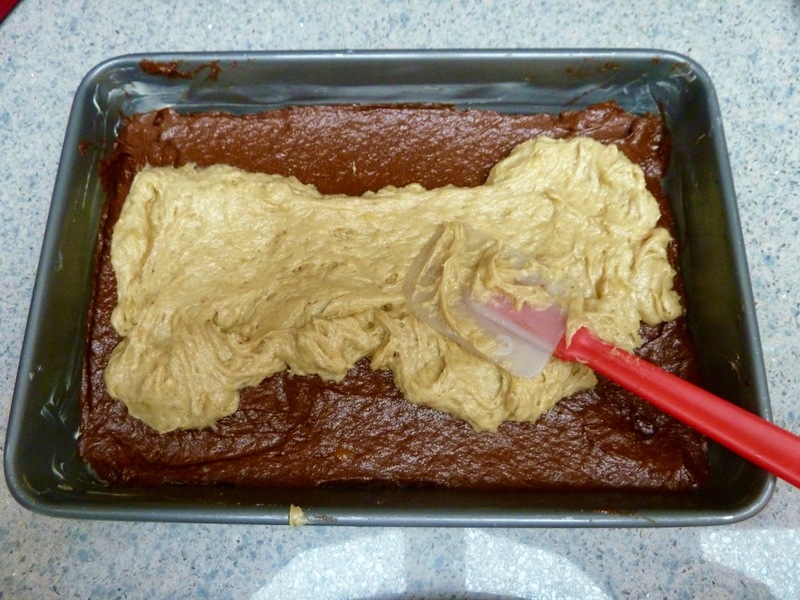 The dough is easy to make. The ingredients are easily found. 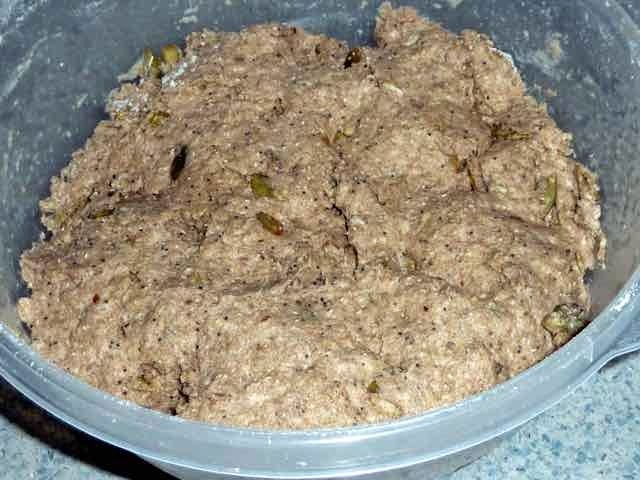 It is a great concept to mix up a batch of dough and keep it in the fridge until you want to make a loaf. Sort of like having the convenience of pre-made refrigerator rolls only you do need to allow for rising time as well as baking time. The book includes recipes for many different types of breads, pizza, and pastry items. They have a website with the Master recipe and flour blend, so you can try it before buying the book. 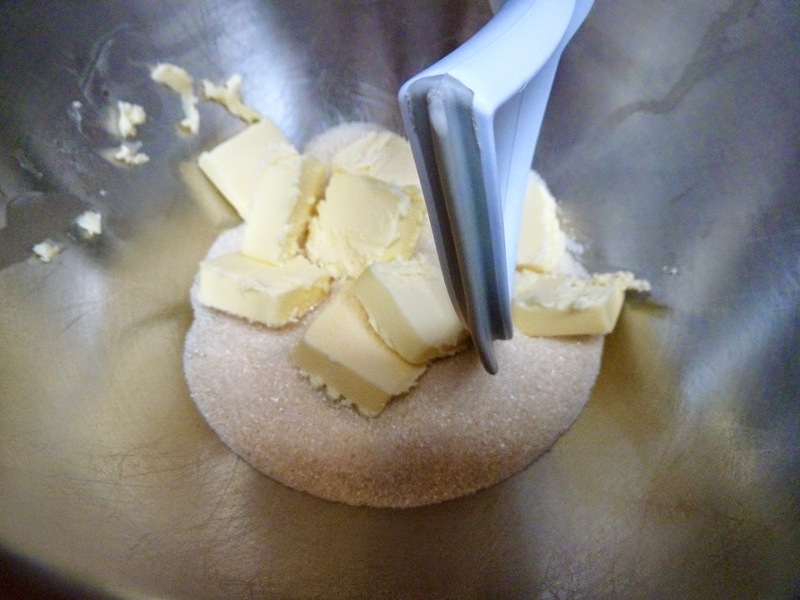 The website also answers many baking and substitution questions. I am posting my favorite, so far, the Seeded 100% Whole Grain Loaf. I have written the recipe for one and two loaves; in case you want to try to bake a second one in the five day period and get an idea of how convenient it is to make bread when you have the dough in the fridge. 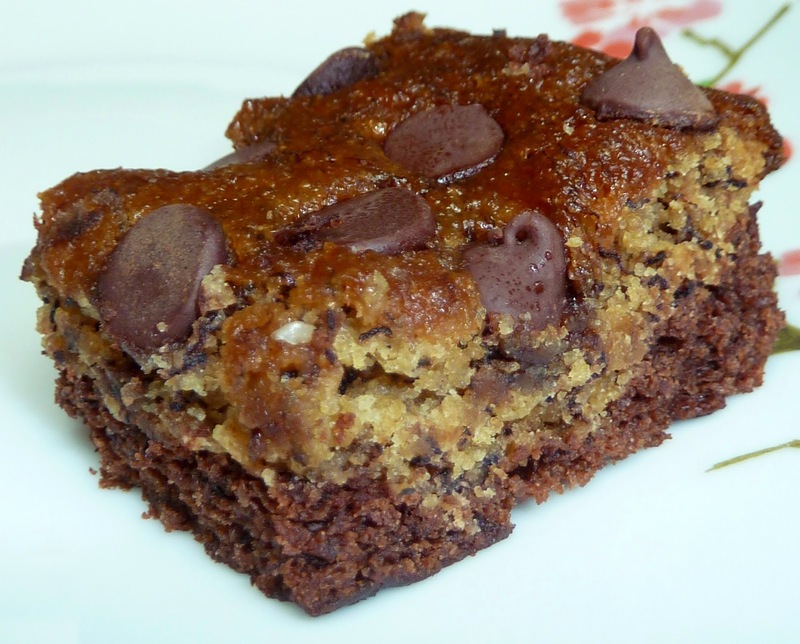 This recipe is posted as I made it. There are some substitutions that are given in the book, but I did not try them. 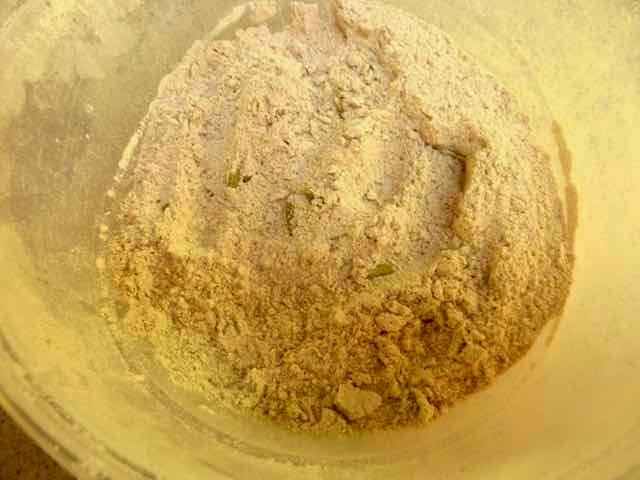 You can substitute ground psyllium seed instead of xanthan gum by using 4 Tbs. for 2 loaves and 2 Tbs. for 1 loaf. 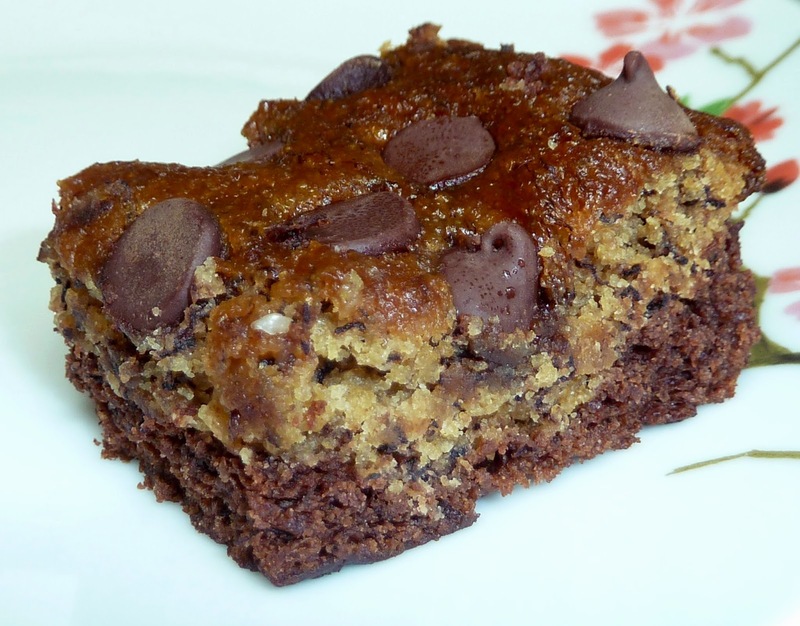 You can substitute molasses or agave for the honey in the same amounts. 2 Tbs. + 1 tsp. 1 Tbs. + 1/2 tsp. In a large bowl mix all the flours, xanthan gum, salt and yeast. 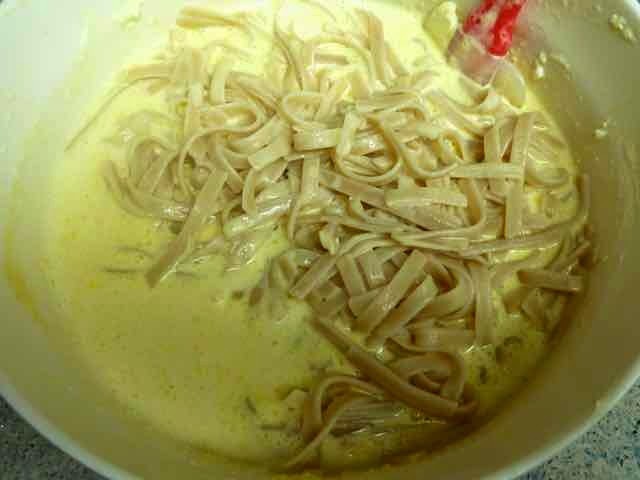 Mix with a whisk until very well combined. Add the seeds and mix again. Add the water, eggs and honey and mix well with a spoon. 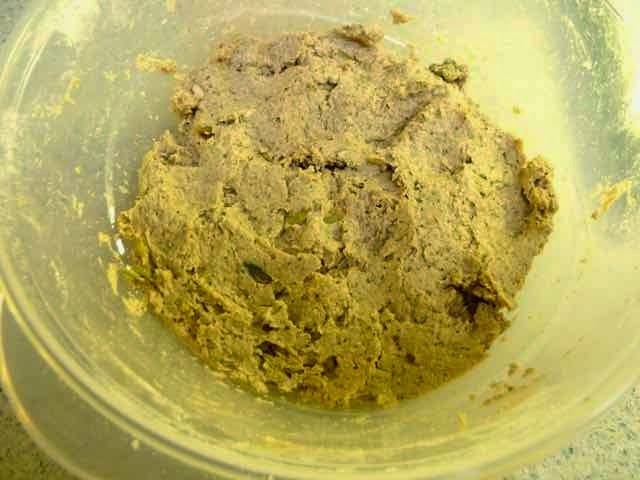 Dough after hand mixing with a wooden spoon. Dough with top smoothed out ready to rest for 2 hours. 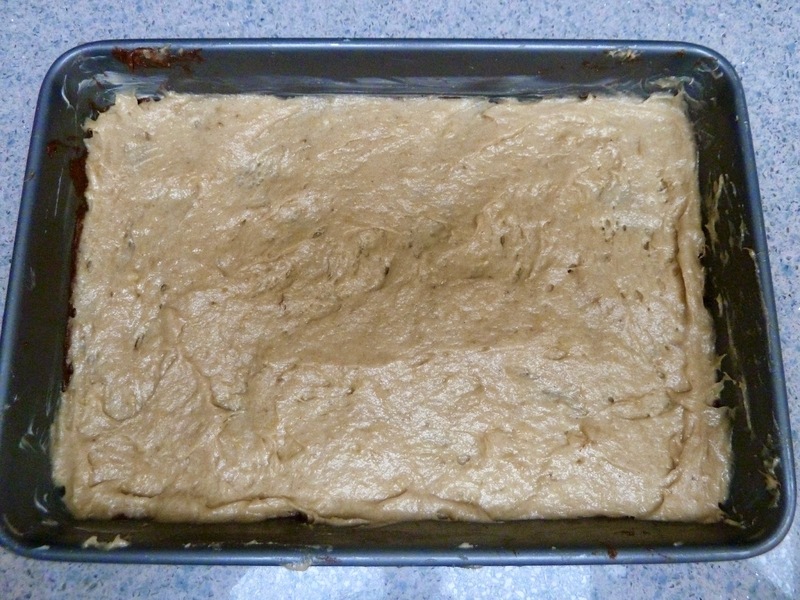 Cover loosely and allow to rest at room temperature until the dough doubles in bulk, about 2 hours. At this point you can store the dough in the fridge for up to 5 days until ready to bake the loaf or you can make a loaf immediately. Dough after 2 hours at room temperature. If you made enough dough for 1 loaf use all the dough, if you made enough for 2 loaves use half of the dough. 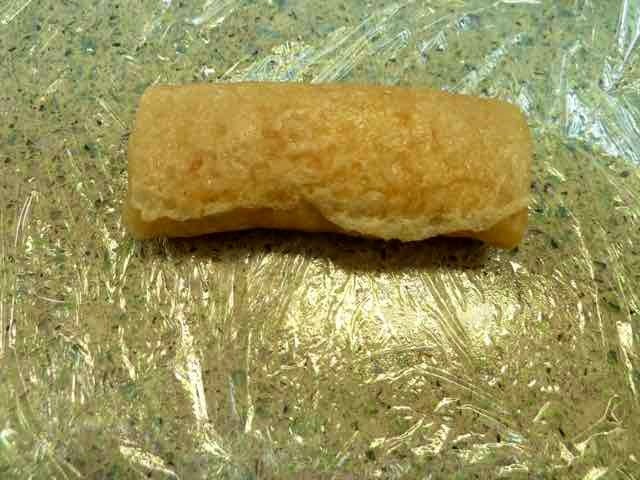 ‘Flour’ a piece of parchment paper with corn meal. With wet hands, take the dough, place it on the prepared parchment paper and then shape the dough into a boule or a fat log (good for sandwiches) or whatever shape you like. Wet your hands again and smooth the top of the loaf. Make a few slashes across the loaf with a serrated knife. This keeps the bread from cracking in an uneven manner. Dough on parchment paper "floured" with cornmeal. 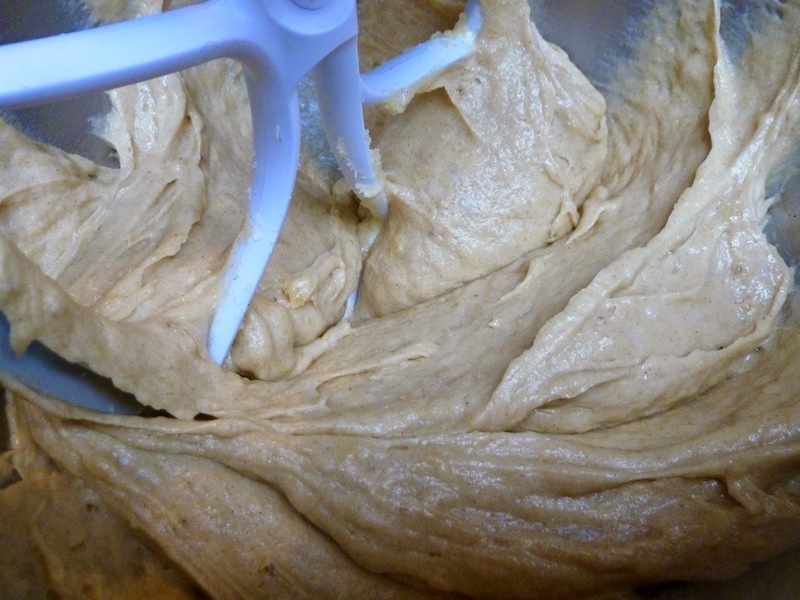 The dough has been smoothed and shaped with wet hands. after an egg white wash and sunflower seeds were put on top. 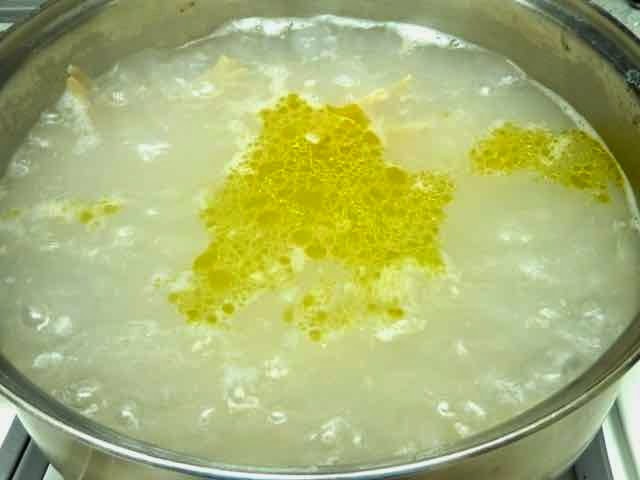 If you like, brush the top with egg white, oil or water and sprinkle with some seeds such as sunflower, sesame, pumpkin or any others that you prefer. Loosely cover the loaf with plastic wrap or a large bowl and allow to rest for 1 hour. 30 minutes before baking, place a rack in the center of the oven and place a pizza stone on the rack. On a rack below, place a broiler tray or other oven safe pan. Preheat the oven to 450℉. After the dough has rested and the oven is preheated to 450℉, slide the loaf, still on the parchment paper, onto the pizza stone in the oven. Pour 1 cup of hot water into the broiler tray or the other oven safe pan. The moisture from the steam helps the bread to rise and bake in the oven. 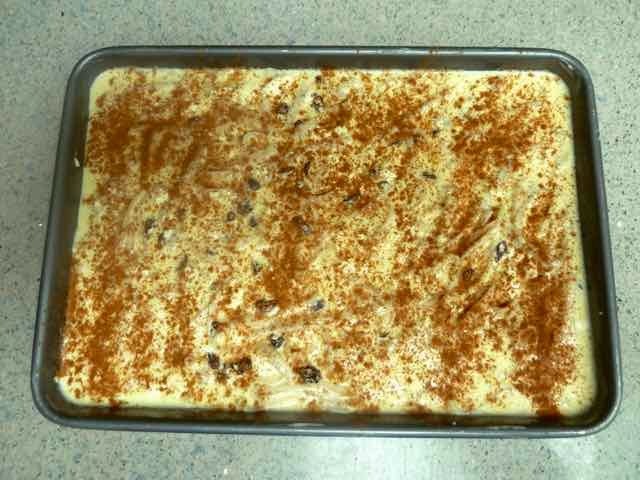 Bake about 45 minutes, until the loaf is nicely browned or until the internal temperature is 210℉. Allow the baked loaf to cool on a rack. Do not slice the bread when hot or you will have a dense gooey loaf. Be patient and allow the loaf to cool, the results are well worth the wait. Slice the cooled loaf with a serrated knife. Enjoy. 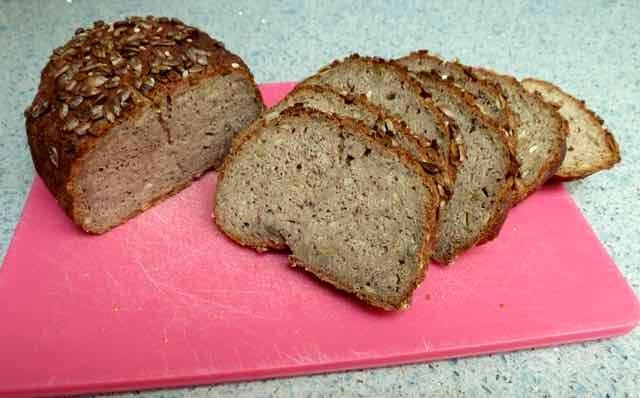 Gluten Free Seeded 100% Whole Grain Loaf Ingredients 2 LOAVES 1 LOAF 125 gm/9 oz. 62.5 gm/4.5 oz. Brown Rice Flour (extra fine grind) 125 gm/9 oz. 62.5 gm/4.5 oz. 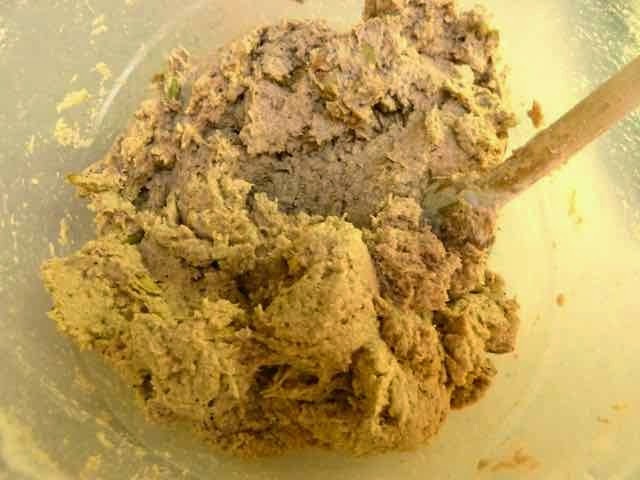 Sorghum Flour 125 gm/9 oz. 62.5 gm/4.5 oz. Teff Flour 125 gm/9 oz. 62.5 gm/4.5 oz. Certified GF Oat Flour 2 Tbs. + 1 tsp. 1 Tbs. + 1/2 tsp. 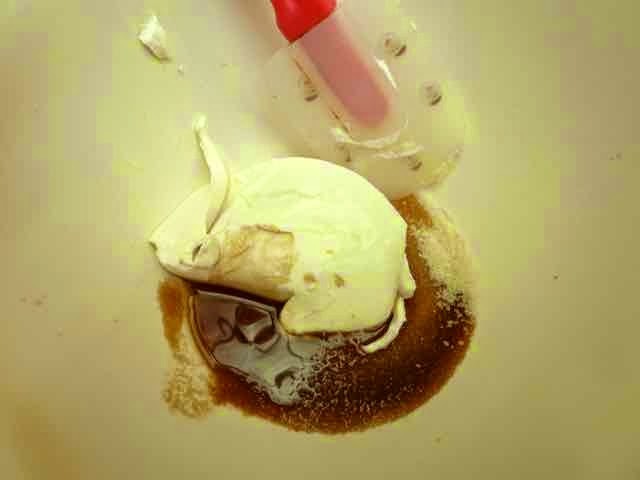 Xanthan Gum 1 Tbs. 1 1/2 tsp. Ground Flax Seed 2 Tbs. 1 Tbs. Sesame Seeds 1/4 cup 2 Tbs. Shelled Pumpkin Seeds or Pepitas 1 1/2 tsp. 3/4 tsp. Yeast Granules 3/4 tsp. 3/8 tsp. Sea Salt 2 cups/455 gm 1 cup/228 gm Warm Water (100 - 110℉) 2 Tbs. 1 Tbs. Honey 2 large 1 large Eggs 1 Tbs. per loaf 1 Tbs. Corn Meal for ‘flouring’ the parchment paper Directions FIRST MAKE THE DOUGH In a large bowl mix all the flours, xanthan gum, salt and yeast. 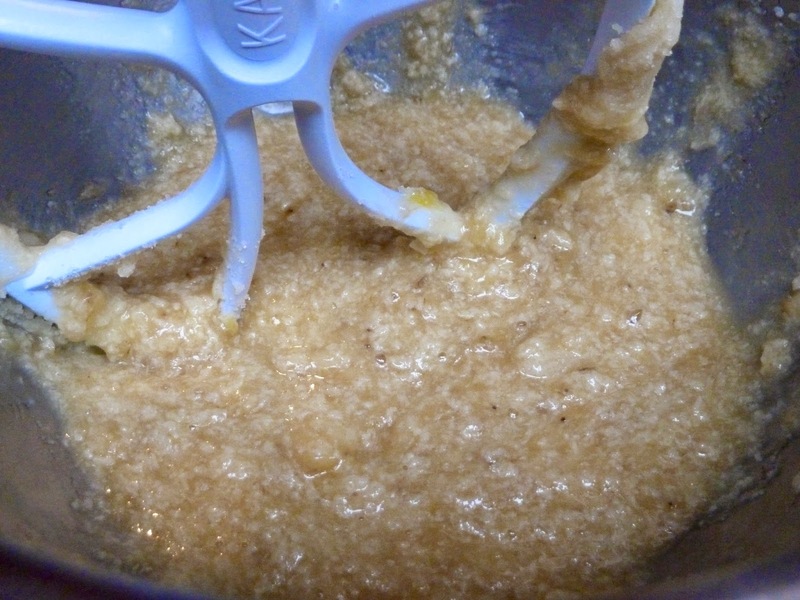 Mix with a whisk until very well combined. Add the seeds and mix again. 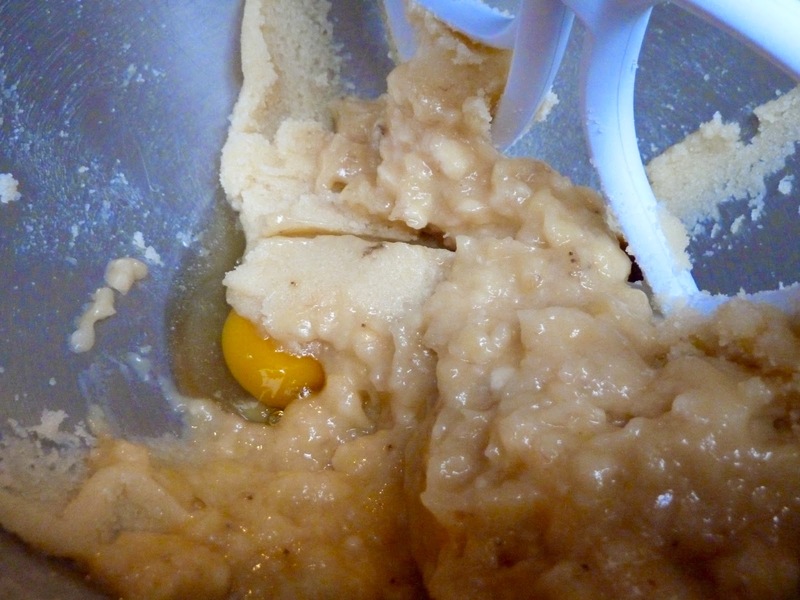 Add the water, eggs and honey and mix well with a spoon. 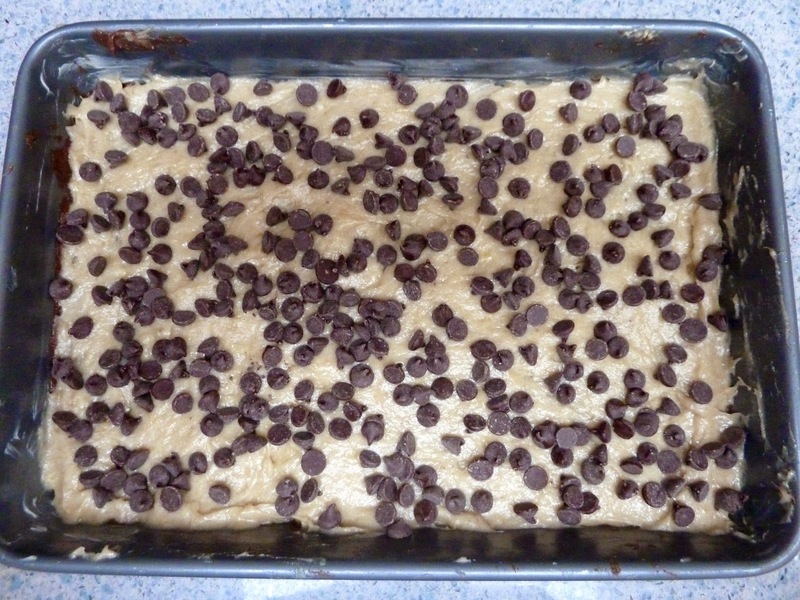 Cover loosely and allow to rest at room temperature until the dough doubles in bulk, about 2 hours. At this point you can store the dough in the fridge for up to 5 days until ready to bake the loaf or you can make a loaf immediately. WHEN READY TO BAKE THE BREAD If you made enough dough for 1 loaf use all the dough, if you made enough for 2 loaves use half of the dough. 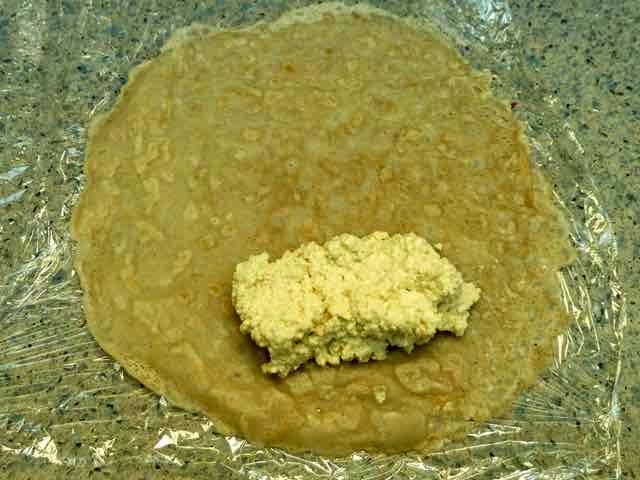 ‘Flour’ a piece of parchment paper with corn meal. With wet hands, take the dough, place it on the prepared parchment paper and then shape the dough into a boule or a fat log (good for sandwiches) or whatever shape you like. Wet your hands again and smooth the top of the loaf. Make a few slashes across the loaf with a serrated knife. This keeps the bread from cracking in an uneven manner. If you like, brush the top with egg white, oil or water and sprinkle with some seeds such as sunflower, sesame, pumpkin or any others that you prefer. Loosely cover the loaf with plastic wrap or a large bowl and allow to rest for 1 hour. 30 minutes before baking, place a rack in the center of the oven and place a pizza stone on the rack. On a rack below, place a broiler tray or other oven safe pan. Preheat the oven to 450℉. After the dough has rested and the oven is preheated to 450℉, slide the loaf, still on the parchment paper, onto the pizza stone in the oven. 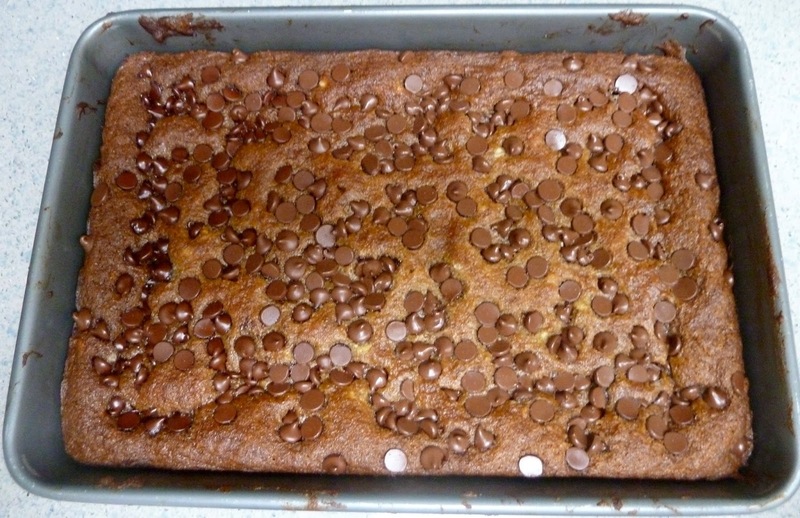 Pour 1 cup of hot water into the broiler tray or the other oven safe pan. The moisture from the steam helps the bread to rise and bake in the oven. 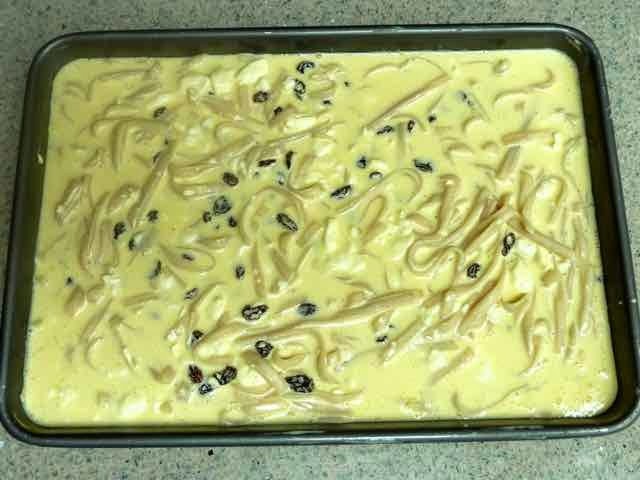 Bake about 45 minutes, until the loaf is nicely browned or until the internal temperature is 210℉. Allow the baked loaf to cool on a rack. Do not slice the bread when hot or you will have a dense gooey loaf. Be patient and allow the loaf to cool, the results are well worth the wait. Slice the cooled loaf with a serrated knife. Enjoy.